This post is sponsored by McCormick in conjunction with a social media campaign through Sunday Supper LLC. All opinions are those of the individual bloggers. Easy Jambalaya Stuffed Peppers are a fun twist on traditional Jambayala and a great way to celebrate Mardi Gras this year! Colorful bell peppers are filled with an Andouille sausage jambalaya stuffing and are bursting with all the Cajun/Creole goodness NOLA is known for! Since my first visit to the amazing city of New Orleans many years ago, I've been a huge fan of the unique cuisine they are known for. Mardi Gras, which is celebrated during the two weeks prior to Lent, is a festive time full of parades and amazing food. Jambalaya is a dish that has become synonymous with this holiday and New Orleans itself. 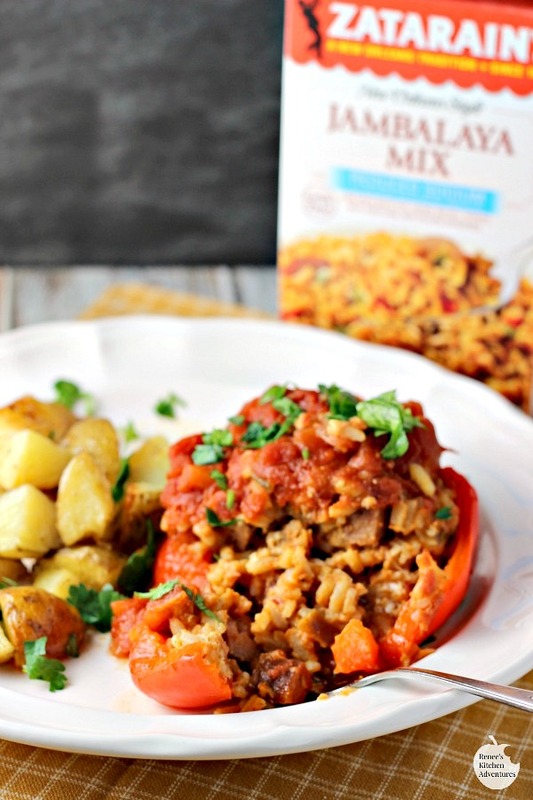 While I won't be attending the Mardi Gras celebrations in NOLA this year, I will be honoring the flavors here at home with these Easy Jambalaya Stuffed Peppers, made with the help of Zatarain's Jambalaya Mix. I'm so happy to be partnering with Sunday Supper and Zatarain's this week to bring you this fun twist on a New Orleans classic. Zatarain's has been in business for over 125 years and they know how to keep all the flavor of traditional jambalaya in a quick and easy mix that is the star of this recipe. We love stuffed peppers in this house, and since Jambalaya starts with the traditional trinity of vegetables (peppers, onion, and celery), I thought stuffing the rice dish into some colorful peppers would make a fun and tasty presentation. I wasn't wrong! Peppers make the perfect vessel for the Jambalaya! My family loved these stuffed peppers and I loved how very easy they were to make! You can adjust the heat level to your linking by adding or leaving out hot sauce. It's totally your call! For me, bring on the heat, baby! I served these peppers with some simple oven roasted potatoes I dusted with Creole seasoning and garlic powder before baking for a complete meal! Will you be celebrating Mardi Gras (Tuesday, February 9, 2016) from wherever you are this year? If so, what will you be doing to celebrate? 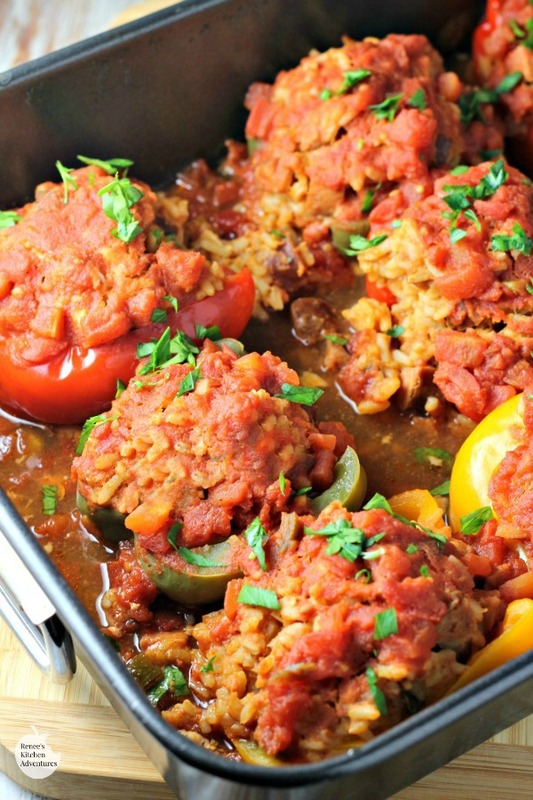 Colorful bell peppers are stuffed with prepared Andouille sausage Jambalaya and topped with a spicy tomato sauce. Preheat oven to 350 degress F. Spray a large pan (I use a roasting pan) with non-stick spray. Cut peppers in half lengthwise cutting out stem and discarding ribs and seeds. Place peppers cut side up in pan. Sprinkle peppers with some salt and pepper. Set aside. In a small bowl, combine the tomatoes, tomato sauce, sugar, Creole seasoning and hot sauce (if using) . Take out 1/2 cup of the mixture and set aside rest for topping the stuffed peppers. To the prepared Jambalaya, add andouille sausage and 1/2 cup reserved tomato mixture. Stir to combine. Spoon Jambalaya evenly into each pepper half. Once peppers are full, spoon tomato mixture evenly onto the filled peppers. Cover pan with foil. Bake in oven for 1 hour, or until the peppers are tender. Remove foil and sprinkle with chopped parsley before serving, if desired. Total time: 1 hrs. 40 mins. For more Mardi Gras and Jambalaya inspiration, make sure to check out the Sunday Supper Jambalaya Recipes featuring Zatarain's Mixes and Creole Seasonings Pinterest Board! Join me in following Zatarain's on all their social sites and learn more about their complete line of products on their website! Check out all the amazing Zatarain's recipes created by the Sunday Supper Tastemakers! Oh, man, do those look GOOD, Renee! Thanks Stacy. They really are good and really easy to make! Oh, boy, these could be my new favorite stuffed peppers recipe! What a terrific filling!! Haha...thanks Liz. I think they are our new favorites! Grumpy is so picky about peppers and he kinda "grumps" when he thinks I'm making anything as an entree with them, but I LOVE them. These look amazing and he may have to just "grump" sometime soon because I want some! What a scrumptious looking dish Renee! I'm pinning and saving the recipe - my family will love this! I love these! 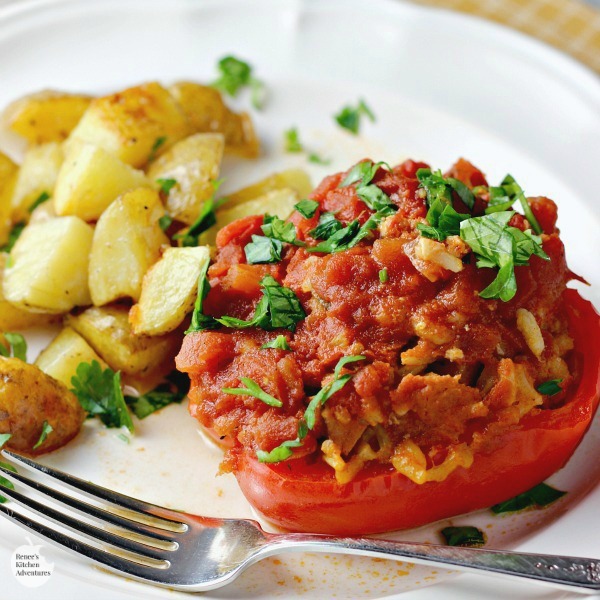 Stuffed Peppers are a total comfort food!